‘Felool’ is the Arabic word designating ‘remnants of the regime’, that is, those who lost power and influence after the revolution, having formerly benefited by proximity to Mubarak and his circles of influence. An Islamist favors a system of government in which sharia law plays a principle role in determining legislation. What then are they doing in my home? Well, they belong there. They are my two oldest daughters, aged 5 and 4. Our youngest, age 2, does not yet have political consciousness. But in many cases, ‘felool’ also served as an accusation to throw around against political opponents deemed not sufficiently revolutionary, or sufficiently Islamist. In its final incarnation, used thereafter in this article, it applies specifically to the candidacies of Ahmed Shafiq and Amr Moussa, and their supporters. So why is my oldest daughter felool? Here is the imagined explanation, sufficiently plausible. The Egyptian political spectrum has evolved into basically three camps. The first camp is Islamist. Mohamed Morsy represents the Muslim Brotherhood, and while Abdel Munim Abul Futuh has sought to position himself as a centrist, he still identifies as an Islamist. Having gained the endorsement of many Salafis, he has scared away a number of former centrist or revolutionary supporters. The second camp, as mentioned above, is felool. Ahmed Shafiq was Mubarak’s last-ditch prime minister, appointed to stem the tide of the protests. He carried on for a little while after Mubarak stepped down, but continued protests in Tahrir forced Shafiq’s sacking as well. Running for president, he does not outright call for a return to the days of Mubarak, but he does call for a return of stability and opposition to Islamists, with lip service to the youth of the revolution. Amr Moussa is less felool, having served in Mubarak’s cabinet early in his administration but having more detachment from the regime while serving as chairman of the Arab League up until the outbreak of the revolution. Still, he is old, and certainly a product of the Mubarak era. He will be gentler with diverse political parties, most likely, but still represents stability and non-Islamism, as well as a vote toward ‘reform’ rather than ‘revolution’. The third camp says a pox on both your houses. Hamdeen Sabbahi is an old school Nasserist, which means he is a nationalist with socialist tendencies. His campaign has been advancing as of late as many voters are fed up with the above choices. They have rejected Mubarak, but don’t trust Islamists. This is where my daughters come in. We are an American Christian family living in Egypt. We have attempted to live in the culture, speaking the language as best we can. Within this choice we worship at the Coptic Orthodox Church, and my daughters both attended preschool therein. The oldest just completed kindergarten as the only non-Egyptian in her private school. If you tweak out the demographics of this simple description of our lives, you will find we are predisposed to supporting the felool, and to a lesser degree, Islamists. Yet we also see the conservative religious make-up of much of Egyptian society, and recognize the right of a people to be governed according to its mores. Islamism should not be dismissed in principle, though certain interpretations may be. We are comparatively wealthy, having our daughter in a private school. Those who benefitted economically from the Mubarak era are more inclined to support felool candidates. Yet Islamists are also successful businessmen in Egypt, having much support among the middle class, which populates the private school our daughter attends. We are Christians, and rub shoulders with the Copts. This community is desperately worried about the possibility of Islamist rule, especially the Muslim Brotherhood. Their oft-spoken preference is for Ahmed Shafiq. As is the preference of my oldest daughter. Yet we also place high respect on the values which drove much of the Egyptian revolution, and recognize the corruption and lack of representation characterizing much of the Mubarak regime. We sympathize with those who desire an Islamist, yet revolutionary candidate, and their oft-spoken preference is for Abul Futuh. As is the preference of my second daughter. My daughters do not know the names of any other candidates. Perhaps they simply picked up on the name their Western, school, and Coptic friends banter about, who themselves have picked up on the name uttered by their parents. That is the plausible, though invented explanation. The reality is much simpler. 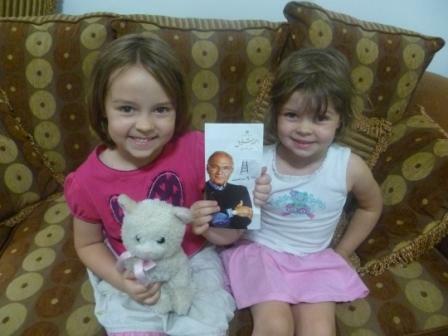 Now my daughters do the same, even the Abul Futuh supporter. Many Egyptians have shown political acumen far beyond their nation’s democratic experience. Others, perhaps, have made their decision in a similar matter, gauging the preference of those in the area, or gravitating to the candidate with the greatest name recognition. Surely, however, they have not done as my second daughter. Each candidate sports a symbol to help illiterate voters find their preferred candidate on the ballot. Mohamed Morsy, of the Brotherhood’s Freedom and Justice Party, has the scales of justice. Sabbahi, the Nasserite nationalist, bears an eagle akin to that on the Egyptian flag. My four-year-old, simply, likes Abul Futuh’s orange horse. As a foreigner I escape the responsibility, and privilege, of having to decide. Yet my respect and admiration goes to the Egyptian people seeking to craft the future of their nation amidst diverse paths. Felool and Islamists may reside peacefully in the same home. Interesting article – as Christians, how are you doing now? Ourselves? Just fine. Christians around us? They’re pretty happy also that Morsi is out. Down in Upper Egypt? Well, I don’t know personally yet, but that is where most of the churches burned. But the ones I’ve seen speak in the media say it was a price they were willing to pay for a new Egypt. We’ll see.